Modern, fast action 4 piece rods that can deliver the goods with power and finesse. We designed each rod in the series to meet specific angling challenges and then tuned the actions to make these the best casting, best fishing rods we have ever offered. Finally, we added the highest quality hardware we could find, a hand shaped specie cork grip, and packaged it all in an integrated rod/reel carrier to protect it during your travels. And all at a price that sets a new standard for value. Whether you target trout, stripers, bones, tarpon, bass or salmon there’s a Big Sky rod for you! Delicate and light in the hand, but powerful enough to beat the wind. Fine in the tip to protect light tippets, but with enough length to control drift. The 904-4 Big Sky is the light line choice for fishing smaller flies on bigger rivers and tail waters East, West, wherever the trout are rising! Here’s the trout rod that does it all on medium to large rivers. The 9’ 5 wt is the number 1 selling fly rod in the US, so we had to get this one right! Easy casting at all distances, with enough power to handle wind and the whole range of trout fly sizes. Strong enough to put the boots to a running rainbow, but able to fish size 18’s on 6X. Whether it’s fishing PMD emergers on the Missouri, reaching out to a rising brown on the Beaverkill, or nymphing the Green, the 905-4 Big Sky is the one trout rod you can take anywhere! Perhaps the most versatile freshwater rod in the Big Sky series, the 906-4 covers the whole spectrum of fly-fishing challenges. 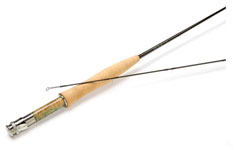 Casting dries, streamers, and nymphs to trout, chasing Smallies, tossing a popper to Blue Gills, or fishing smaller flies for Steelhead, this rod is up to the task. East or West, if you are going to own just one fly rod say “hello” to the 906-4! A salty action 6wt rod with a 1” fighting but that teams up perfectly with Cortland’s Tropic Plus lines and freshwater Rocket tapers for chasing Red-fish, small bones, Small-mouth Bass and giant trout. This rod provides the smoothness that 6wt rods are famous for along with the needed boost for longer casts and fishing heavier flies in light salt and heavy fresh water situations. Bigger than a 6, not quite an 8, but just right in so many situations! The 7 wt is perhaps the most overlooked line size in fly-fishing, but it’s also one of the best. Light enough to be easy casting, powerful enough to throw larger flies and put the smack down on bass, bones, steelies, salmon, big trout, reds, you name it! And the Big Sky 907-4 is one great casting 7 wt! Teamed up with a Cortland Type 3 full sinking line and a big streamer this rod will punch like a heavy weight into almost any wind. Or with a floater, deliver a Charlie right on target to a cruising bone. If you don’t own a 7, you owe it to yourself to find out what you’re missing! In a world where 8wt’s have become relabeled 9wt’s this rod stands true. Not an unforgiving “stick”, not a floppy “wimp”. This rod’s smooth power generates high line speed for greater distance when you want it, along with accuracy and delicate presentation when you need it. That’s what this true 8wt is all about. For all the reasons you would choose an 8 wt, the Big Sky 908-4 is the one to choose. The need for longer casts in pants whipping winds in both salt and freshwater situations has elevated the 9wt to a must have rod for many avid fly fisherman. However when that that close range fish pop’s up out of now where (and you know they do) creating the need to load the rod and react quickly with a close accurate cast with out landing the fly like a cannon ball, many turbo 9wt’s don’t can’t get it done. We dialed back the tip action on this rod to accomplish this task with out sacrificing power and distance. It cast’s like a 9wt should in the wind and like a 8 ‘6” 4wt on a short cast when it needs to making it a complete 9wt fly rod. Think of the 10 wt as the heavy cruiser of fly rods. Here’s the rod for Pike, Musky, Stripers, small to medium tarpon, or any other fish that will grab a big fly and not want to give it back. Many tarpon guides now recommend the 10 wt as the best all round fly rod for it’s combination of easy casting and fish fighting abilities. The Big Sky 910-4 is a truly powerful 10wt that the average caster can load and handle with ease. It can match distance with any rod out there, yet still fish in close for full range versatility. Another overlooked line size, the 11 wt has always been an “in between” rod. The Big Sky 911-4 is going to change that thinking! Many guides feel that because of its ability to go long and short with spectacular control and great ease, handling both small and big fish…. The 11 is their new “got to have rod.” The Big Sky 911 is going to put a lot of flies into the mouths of big fish everywhere, and find a home in the hearts of many fly fisherman. Over the last decade no weight fly rod has improved more than the 12. They’re a rod designer’s ultimate challenge. Take the heaviest rod and make it light in the hand while having the strength to handle a 200lb maniac. Design it to cast in the strongest fishable winds and still lay down a sweet 30 footer right now. We put all those things into this rod and took it one step farther by making it an unparalleled value. The challenge is up to you to find a 4pc rod w/tube that matches this rod’s performance at this price. Just for you we’ve raised the bar and lowered the cost on an elite 12wt rod.